I landed in snowy Traverse City under a brilliant blue sky, picked up a car and drove up to meet Jerry at his farmhouse about forty minutes away. He was waiting outside for me when I pulled up his driveway, his huskies yelping and wagging their tails. He is probably about my age and such a friendly guy. As he has no stake in the sale he has been a great source of help and advice too. The GMC is being stored in a large barn not far from his house and had already been pulled out when we got there, sitting pretty in the sunshine. It seemed compact and very seventies, but smart and in good shape. Climbing inside I was struck by the naff curtains and I'm not sure about the seat colour but it fired right up and off we went - Jerry at the wheel as we had a noon appointment to make back in Traverse City. I was struck how smooth and relatively quiet the ride was as we hustled along through the snowy back roads. Jerry said he had driven about ten of these old buses and that this was by far the best-handling. Back in Traverse City we met the other Jerry who owns a Midas franchise. He's an older chap with a GMC project of his own in the back of the shop, along with a classic fire engine he is restoring; its red and old letters spelling out "Same Day Fire Service" along the side. I came to him to check out the GMC's frame which is a time and money vampire if it needs to be fixed. After peering into its underbelly from all angles, he declared it to be in "the best shape I have ever seen in a GMC - like new". We spent a good hour opening hatches, running the generator, checking connections and firing up the air conditioners. Everything worked. His view was that everything mechanical that needs to be sorted seems to have been sorted. Lots of those things were listed on the spec sheet, but we found other bonuses like new water tanks, upgraded brake and battery components and even a full roof cover for it in the top box. We all enjoyed chewing the fat and kicking the tyres so I suggested lunch and we carried on the GMC conversation over fish, chips and beer. Then Jerry 1 and I peeled off. I drove this time. The accelerator pedal seemed very stiff, but it was easy to drive and the steering was very smooth. We got back to the barn for a thorough going over of other stuff. The interior is not perfect but it is really pretty good. The carpet seems like new and the little bathroom is amazingly clean and nice. The stove seems never to have been used. The built in vacuum whirred up to speed straight away and all the lights went on, as did the DVD player built ino the dash, hich connects to a drop down screen in the ceiling. The sink drainers are grotty, but can be easily changed and Tom's bunk works well, though, again, the colour is not us. There is storage under all the seats but finding a place to put our millions of cereal boxes could be a problem... I could go on, and no doubt will, but perhaps not here. Suffice to say I handed over the check and will come back on March 10th to pick it up. Wow. We own an RV. Its 5.30 in the morning. and I have just got on the plane to Chicago.Its a relief to have escaped the televisual bombardment of Tiger Wood's repeated apologies! My cheery cab driver slithered his way down an icy Cambridge place in the wee small hours and as we were crossing Memorial Bridge he pointed something out to me. Up on the rise in Arlington National Cemetary ahead of us there was a tiny orange flicker in the darkness. It was the eternal flame at the JFK memorial. Because of the summer foliage You can only see it from the bridge at this time of year and only when it is dark. Oh the lengths you have to go to see some things eh? The story so far of Jerry, Jerry, Richard, Richard and Richard. After many phone calls and much head-scratching, I think everything is ready for me to see the GMC this weekend. Thankfully, everyone in this story is called some variation of either Jerry or Richard, just to make things easier. GMC owner Rick from the U.P. spent ninety minutes going over it on Wednesday and reckoned it was probably a "turnkey coach"; ie show up, turn the key and go. Well that's what we need, though of course our Corvette was just the same, and two hours down the road the coil died, so you never really know... I will be getting up at about half past four tomorrow morning for an early flight to Chicago, where I change for Traverse City, get a car and drive 45 minutes north to Northpoint where I meet Jerry who is looking after the coach for its owner Richard, in North Carolina. I'll have a good look over it and next week Jerry will drive it to Jerry at Midas (another GMC owner) who will put it up on his lift to check out the frame. If Jerry thinks all looks good, Jerry will drive it back and armed with the information from Jerry and Rick, this Richard will call the other Richard and maybe we can do a deal. Curiously at least three people called Ken have also offered their help. As I write, Rick from Michigan is on his way to have a look at this coach for me. The photos are from the site where I first saw it advertised. I have been amazed by the number of GMC owners who have got in touch to offer their help. One owner in southern Michigan emailed me that he would be only too happy to gather a couple of his other GMC buddies and drive up on Saturday to check it out. "Its only a 600 mile round trip" he said... There really is something about these old buses that generates an outsized enthusiasm among the owners. Its as if they are all in on some big secret and can hardly wait to share it. I have had numerous conversations with owners and experts over the past few days, all with good advice - and warnings. I am hoping to line up a mechanic in Traverse City who can give it a full inspection on Saturday. Jerry, who is looking after it has offered to drive it down from Northpoint, where it is housed (about forty five minutes north of TC), and that would give me an extended test drive too. Finger crossed. So. Much has happened since my last post way back in 2009. 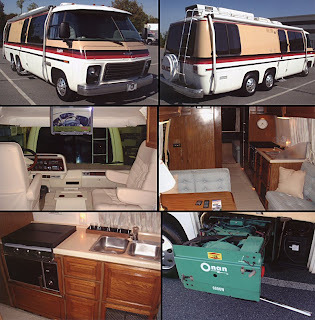 We found out two days ago that we will be staying in the US for another year, so I blew the dust off the GMC project, donned my boiler suit and got back into vintage motorhome mode. There was one I spotted last year that had had all the right stuff done to it - which I could list here if I wanted to stop everyone from reading any further; things like a new engine, overhauled drivetrain, Thorley headers, Alcoa wheels, TBI, overhauled Onan, new dash, re-done interior etc etc, but I won't bore you by listing all of that. Anyway, I am going to see it in Traverse City Michigan on the 20th and if it is as good as it seems to be we are going to buy it. And if we do, I was wondering whether my Dad might want to drive it back to DC with me... sometime in mid to late March...?